Meadows of St. Patrick in Murrells Inlet, South Carolina provides the charm of a quaint coastal town and is located just down the coast from bustling Myrtle Beach. This beautiful community is an ideal spot for those who desire an affordable community with low homeowners' association (HOA) dues in a great location, but are not looking for the level of community involvement found in other communities. Though Meadows of St. Patrick does not offer an amenity center or community activities, there is plenty to keep residents busy throughout the surrounding area. Boating, kayaking, fishing, and other water activities are popular in this coastal town. Murrells Inlet is also well known for its award-winning restaurants found along Restaurant Row on Main Street. And for residents who enjoy golf, Murrells Inlet offers several public courses set amid lovely water features and natural beauty. Meadows of St. Patrick is a community designed for those who prefer less active involvement from a homeowners association. Though this community does not have the central amenities found at many other communities, Meadows of St. Patrick provides other benefits, such as affordable living in Murrells Inlet's lovely coastal location. This historic area will keep residents busy with nearby public golf courses, shopping, dining, and various coastal attractions, such as beaches, boating, fishing and dolphin-sighting tours. The beautiful homes at Meadows of St. Patrick attract buyers who know just what they want. These semi-custom homes are built by Flagship Construction, a local company with a history of both quality and affordability. The single-family homes found at Meadows of St. Patrick have base floor plans that range in size from 1,105 to 1,875 square feet. Homeowners can customize their homes with a variety of options that can make their home expand in size. These thoughtfully designed ranch single-family homes feature open floor plans, three to four bedrooms, two bathrooms, and attached one to two-car garages. Models include upgraded options for features such as screened porches, pocket doors, whirlpool tubs, lever-handled doors, and more. Those who live in Meadows of St. Patrick can enjoy all the charm and natural beauty of Murrells Inlet. Known as the Seafood Capital of South Carolina, Murrells Inlet features many fresh seafood restaurants, as well as a variety of cuisine to please any palate. Residents can also enjoy local shopping, or play a round of golf at one of the nearby golf courses. A few of the public courses found in Murrells Inlet include Indian Wells Golf Club and Indigo Creek Golf Club. As a historic fishing village, Murrells Inlet offers many coastal activities. Fishing charter boats bring guests out to sea, where they can catch some of the areas' famed marine life. Residents and visitors alike can enjoy boating, jet skiing, parasailing, kayaking, or a local dolphin-sighting tour. Nearby Brookgreen Gardens features one of the world's largest outdoor sculpture gardens, and Huntington Beach State Park includes a nature center, trails, marshland, and an undeveloped beach. 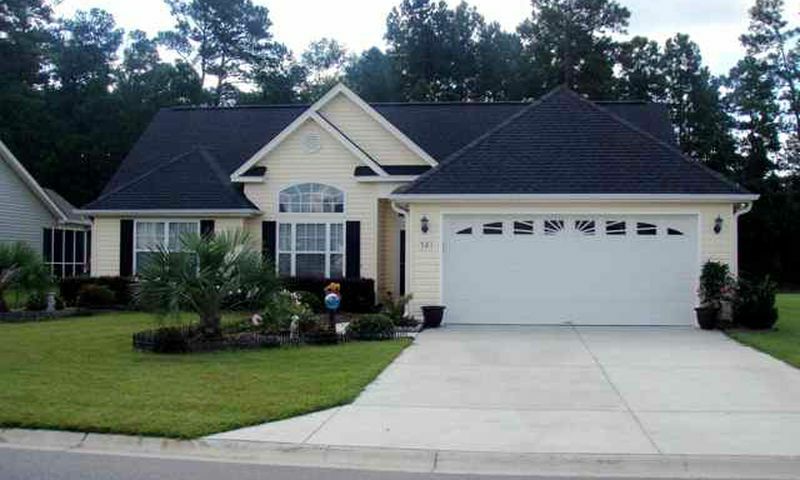 Meadows of St. Patrick is tucked away in a beautiful community within historic Murrells Inlet. Situated in South Carolina's Low Country, Murrells Inlet is a quaint town full of regional charm. This coastal town was once considered a small fishing village, but has since become a prominent vacation spot as part of South Carolina's Grand Strand. Just up the coast, nearby Myrtle Beach offers many shopping, dining, and recreational activities, as well as several state-of-the-art medical centers. Those who travel or have frequent guests will appreciate Meadows of St. Patrick's convenient proximity to Myrtle Beach International Airport. Homebuyers looking for a quiet neighborhood setting, low HOA fee and near coastal attractions can find it all at Meadows of St. Patrick in Murrells Inlet, SC. Check back soon for more information on the lifestyle in Meadows of St. Patrick. These single-family homes range from 1,105 to 1,875 square feet and have three to four bedrooms, two bathrooms, and an attached one to two-car garage. These homes are available as new construction and resale. 55places.com is not affiliated with the developer(s) or homeowners association of Meadows of St. Patrick. The information you submit is distributed to a 55places.com Partner Agent, who is a licensed real estate agent. The information regarding Meadows of St. Patrick has not been verified or approved by the developer or homeowners association. Please verify all information prior to purchasing. 55places.com is not responsible for any errors regarding the information displayed on this website.